This alligator gar is a puny 6-foot, 129-pound version. If you told me this, I wouldn’t believe it. Fortunately, lucky angler Kenny Williams has his catch verified by officials. Apparently, the lucky Williams bagged a record-sized alligator gar, or Atractosteus spatula, while fishing in Issaquena County, near Jackson, Mississippi. A 327-pound alligator gar was caught in Mississippi’s Chotard Lake by fisherman Kenny Williams on Valentine’s Day. Talk about your Valentine’s Day presents! According to officials from the Mississippi Department of Wildlife, Fisheries, and Parks, the alligator gar landed by Jackson is 8-foot, 5 1/4 inches long and a definite 327 pounds. It’s the largest alligator gar ever captured in Mississippi, and is one of the largest gar ever officially captured period. 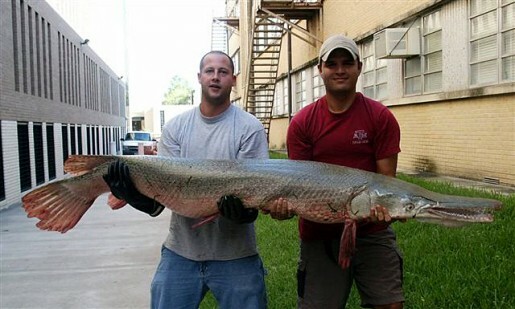 The current world record for a rod-and-reel caught alligator gar is 279 pounds, while the bowfishing record is 365 pounds. No word on whether or not the giant fish will be eaten. Alligator gar is a delicacy in some parts of the South.